This page is in process of being updated. Stay tuned! Noir UI is a dark theme, built on top of CSS3 UI Kit framework and ImagePress. Noir UI requires ImagePress 7+ and WordPress 4.7+ in order to function as intended. I recommend the latest version of ImagePress and WordPress. In addition to this, PHP 5.5+ is required for certain functions and modules. Check with your host before attempting to install Noir UI. Upload the theme using the theme uploader or by using FTP to your /wp-content/themes/. The theme should look like this: /wp-content/themes/noir-ui/. 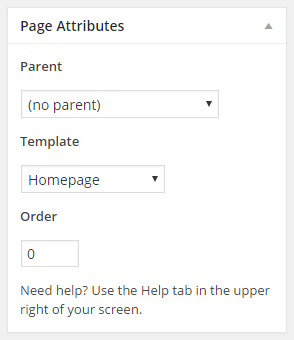 Create a new page and assign the Homepage template (see figure 1). 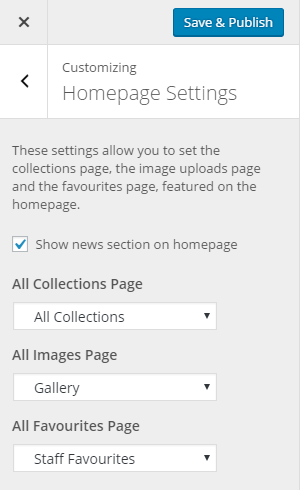 Set up the newly created page as a static frontpage from Settings -> Reading. Download and import our sample posts, pages and images. The theme is now installed and ready to use. The theme can be customized from Appearance -> Customize tab. You can customize colours, add a nice, discreet background overlay texture and display a mosaic of news on homepage. You can also select the main section links. Noir UI comes with several useful element shortcodes such as carousels, images, boxes columns and icons. Note: When upgrading from version 4.x to version 5.x, you will need to move the page-home.php content to a widget (“Homepage widget (main, content)“). Check out my sample code below and replace it as required. Note the image size parameter – size="imagepress_sq_std" – and remove it if you want to use the global size set in ImagePress -> Configurator. Note that some tutorials may use old/deprecated code. We try to maintain all tutorials up to date, but feel free to contact us if something doesn’t work.